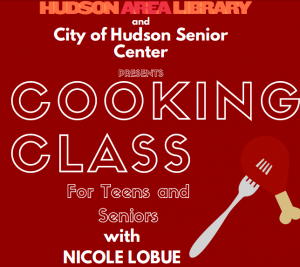 We are happy to announce the next program in our ongoing collaboration with the City of Hudson Senior Center with a free intergenerational cooking class for teens and seniors on Monday, April 10 at 3:30pm taught by local chef and educator Nicole Lobue. This class will give the teen and senior attendees an opportunity to interact as a community of learners and tasters of delicious food. At the teens’ request this first session will cover how to cook (healthy) fried chicken. The class will be held in the senior center on the second floor of the Galvan Armory. Instructor Nicole Lobue is a chef, herbalist, and educator. Nicole’s work has linked food, wellness, service and education in various collaborations, organizations, and in her own private practice. She is a co-founder and co-educator of Wild Gather, an herbalism school in the Hudson Valley, a co-founder of Kite’s Nest, an alternative learning center for young people in Hudson, NY. She is also the Culinary Arts Director of the Alimentary Kitchen in Hudson, where she facilitates workshops and experiences that offer a supportive environment for children and teenagers to pursue and develop a relationship to herbalism, wellness, self care, food access and food justice. Across her work — in her herbalism practice, in the kitchen, or in the classroom — Nicole creates spaces that foster critical inquiry and systems-thinking, connection to plants and to the natural world, and that speak to the intersections between political, personal, and ecological well-being. Registration is on a first come/first serve basis. Please visit the front desk at the Hudson Area Library, or call 518.828.1792 x101 to sign up and fill out a registration form. This entry was posted in Adults, Programs, Young Adults and tagged cooking, intergenerational by Brenda Shufelt. Bookmark the permalink.